The true feel good story of how James Bowen, a busker and recovering drug addict, had his life transformed when he met a stray ginger cat. Based on James Bowen’s autobiographical book of the same name, 2016’s A Street Cat Named Bob takes us to London. There we meet James (Luke Treadaway), a recovering drug addict who busks on the street to raise money. Alone and largely abandoned by family due to his abuse issues, James’s life takes a turn when he encounters a stray cat. James helps the feline – who he names “Bob” – and the pair develop an unlikely relationship that sends our lead on a journey of recovery. Normally I’d shun such potentially soppy “feel good” fare as Bob, but a few factors drew me to it. For one, I love animals – I’m much more of a dog person, but I like cats, too, and I’m a sucker for tales about needy critters. Also, there’s the “British Element”. In the hands of Hollywood, I’d assume Bob would become insufferable melodrama, but the Brits tend to lack the same saccharine tendencies, so I hoped the film would avoid the usual treacle. The presence of Roger Spottiswoode helped as well. Best-known for big action flicks like Tomorrow Never Dies, I figured he would keep the production from going too far into Sappy Land. Do these hopes bear fruit? Yeah, sort of – partly. While it does veer into sentimental territory too often, Cat still offers a fairly engaging piece. I like that the film doesn’t sugarcoat the seedy aspects of James’ life. No, it doesn’t offer a Trainspotting-style view of heroin addiction, but it maintains a semi-dark air that gives it gravity. It also stars a charming cat. As I mentioned, I’m more fond of dogs, but Bob creates a likable personality, and the movie’s depiction of the James/Bob relationship works well. We buy into their connection in a natural manner. On the negative side, Cat doesn’t offer much of a story. It follows predictable paths related to James’ challenges and doesn’t throw out content we can’t see coming our way in advance. It’s a slight narrative that feels padded as the movie waddles toward 102 minutes. These problems aside, Cat still remains largely likable across its running time. Nothing here stands out as exemplary, but the movie brings us a reasonably charming feel-good narrative. 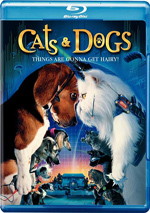 A Street Cat Named Bob appears in an aspect ratio of approximately 2.35:1 on this Blu-ray Disc. This became a good transfer. Sharpness worked fine, as only a few minor signs of softness crept in during a few inteior shots. Despite those instances, I felt the majority of the movie offered nice clarity. No issues with jaggies or moiré effects materialized, and edge haloes were absent. Source flaws failed to become a factor here. In terms of palette, Cat went with a stylized look. In an unsurprising move, the film emphasized orange and teal to a substantial degree. Those tones seemed acceptable given their limitations. Blacks were reasonably dark and tight, while shadows showed good delineation. Overall, the image looked positive. When I examined the Dolby Digital 5.1 soundtrack of Cat, I thought it was moderately active and involving. A fairly chatty piece, the mix used music and atmosphere to nice advantage. These elements created a good sense of place and movement that brought us a decent soundscape. Audio quality was fine. Effects showed good clarity and range, while speech remained natural. Music was also clear and full, with appropriate range. The soundtrack didn’t excel but it connected with the material. I did subtract some points due to the absence of a lossless option, though – a circa 2017 Blu-ray shouldn’t lack one. Only a handful of extras appear here, and we get two featurettes. 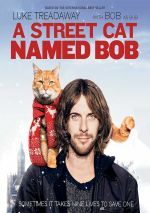 Introducing Bob and The Story of A Street Cat Named Bob run one minute, 36 seconds each, as they include comments from director Roger Spottiswoode, author James Bowen, producer Adam Rolston, and actors Ruta Gedmintas and Luke Treadaway. They give us basics about the story and characters in these brief promotional clips. In addition to the film’s trailer, we get a Slide Show. It displays 57 shots from the set and the movie. The “Slide Show” provides a decent collection of photos. At 102 minutes, A Street Cat Named Bob stretches its slight story a little too thin. Still, it offers enough charm to make it reasonably engaging. The Blu-ray provides very good audio along with decent audio and minor supplements. Cat creates a likable diversion.